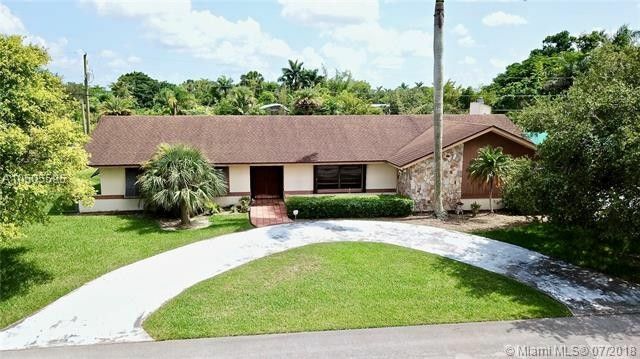 Very well maintained 4 BR/2 BA home located in Country Club Estates golf course community. Tongue and groove ceilings in the living room, family room, kitchen, dining room and master bedroom. Sunken living room w/track lighting. Family room has recessed lighting, real wood burning river stone fireplace and French doors to the patio. Kitchen has a cook island, pantry, eat-at counter, SS appliances and a big pass through window. Master bedroom has his/her closets and French doors to the patio. 35 x 12 screened patio and fenced in backyard. 1500 kw generator with hook up. Accordion and Bahama shutters.